Summer time also means road tripping, along with beaches, BBQs and beer of course. My most recent road trip was to Bar Harbor and Acadia National Park at the end of July. Given my inability to take a vacation without a disc golf stopover, my girlfriend and I planned a route to Bar Harbor via Monmouth and Sabattus. Our first stop was to the Beaver Brook Campground in Monmouth for a 1 night camping stayover on Lake Androscoggin. The campground is set in a beautiful location complete with a nice brook running through the center and plenty of sites right on the water. layout, very similar to Hunt's Mean 18 at Rindge, NH...another Ed Headrick course. Our next stop took us to the Town of Sabattus, Maine. Travelling down Bowdoinham Rd through Sabattus, you see the typical Maine landscape on either side of the road...endless stretches of forest, interrupted by the occasional farm or meadow. Then, like a shining beacon, we see this giant disc golf basket water fountain welcoming us to Sabattus DGC Do you remember that feeling you had as a kid when you were getting ready to board a new roller coaster or some other thrill ride at the amusement park?...that's the same feeling I got pulling into the parking lot at Sabattus...nose pressed against the car window like a dog that just spotted a fat, juicy cat outside....I couldn't wait to check things out! Impeccably groomed, signed and situated, Sabattus contains 3 completely separate courses that branch off the main parking lot in every direction. 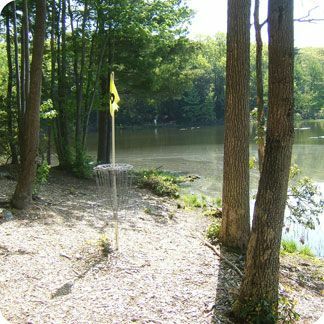 Centered by a really nice and modern pro shop that has everything disc golf related under the sun, the 3 courses (Eagle, Hawk and Owl) cater to all different ability levels with the Eagle being the most challenging and the Owl a short pitch/putt, family friendly 9 hole layout. As expected, Sabattus did not disappoint. We played the Hawk Course first, a nice mix of short, medium and long holes combining open fields with woods and some areas of bordering creek beds. Granite sign posts, wood chips and stone dust throughout, the Hawk was a visual treat. My girlfriend managed to get her first birdie on a 177' par 3! The staff was very helpful and friendly. Both Sabattus and Beaver Brook were well worth the trip and combining the two makes for a really nice disc golf road trip. We played a few holes on the Owl Course before heading back on the road to Bar Harbor and Acadia. If you have any disc related stories you'd like to share, hit me up at staraviar@yahoo.com and I'll post em on the blog. Enjoy the rest of the Summer and see you out on the course!